“Rocky” visits his statue in Philly. 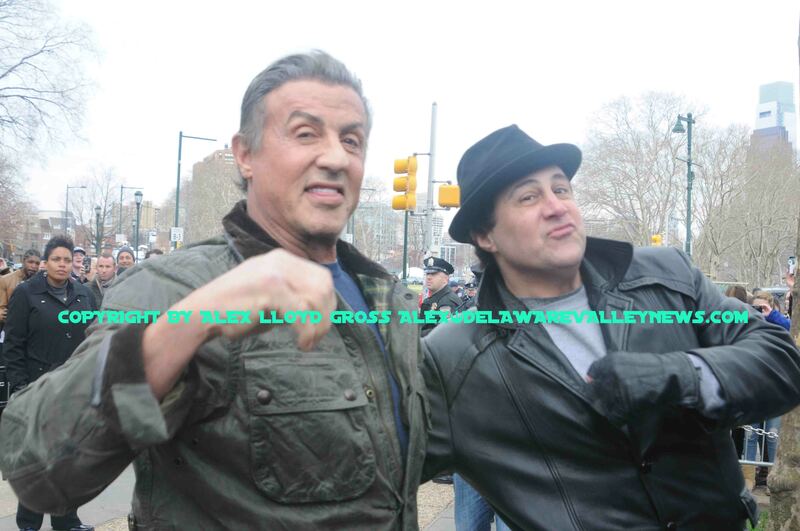 Alex Lloyd Gross Photo- Delaware valley News.com Sylvester Stallone poses for a photo with a look a like before meeting with the mayor. Sylvester Stallone was in Philadelphia today, April 6 2018 and he paid a visit to his likeness, by way of the Rocky statue. This was supposed to be kept quiet and was not listed on the official schedule of the mayor. Stallone was going to show up, talk with Mayor Kenney for a bit and pose for some photos from the media. It turned into a circus quickly. Tourists that visited the statue saw accommodations for the media and quickly knew that the press is not going to just cover the statue. Something was up and the smart ones stuck around. Including a girls volleyball group from Florida, They showed up to run up the steps of the Art Museum , wearing home made Rocky T Shirts. They would soon get more than they ever hoped for. 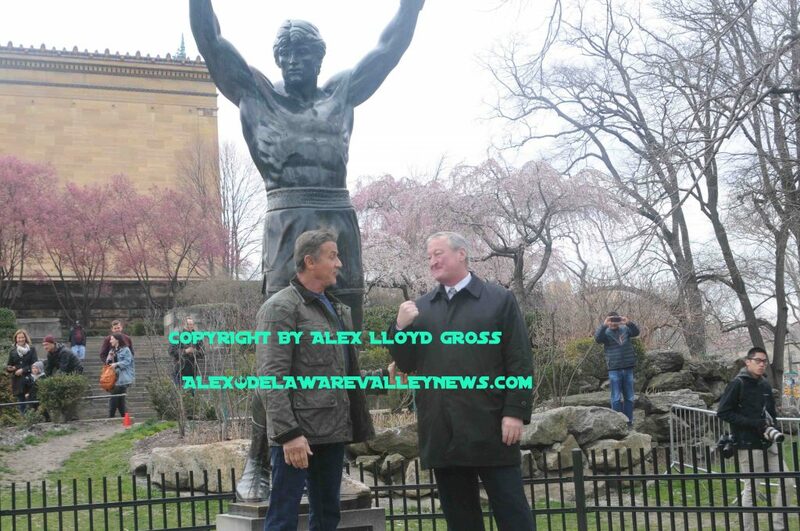 Alex Lloyd Gross Photo- Delaware Valley News.com Mayor Kenney shows Sylvester Stallone how to make a fist. 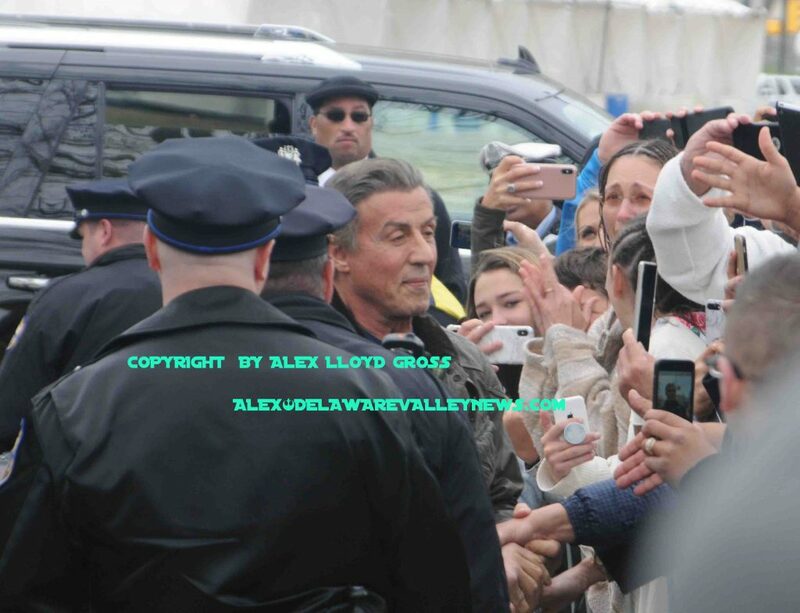 Alex Lloyd Gross Photo- Delaware valley News.com Sylvester Stallone meets fans at the Rocky Statue. Then he left. Or at least he tried to leave. He spotted the girls volleyball team and posed for a quick photo with them. He shook hands with a few fans, posed for a picture with his police detail and then was whisked away, presumably to work on the next Creed movie , which is being filmed in and around Chester Pa.